We are often asked what does mold look like, especially black mold, or Stachybotrys chartarum, which is known to cause numerous health problems. We’ll show you some mold photos to help you identify black mold in your home. Keep in mind, though, that there are over one hundred different types of mold that have been found growing in American homes, and we cannot show you mold photos of every kind. Consult a mold removal specialist if you need more information about what does mold look like or if you need help identifying the type of mold growing in your home. Also, know that while some forms of mold tend to cause more health problems than others, all kinds of mold can cause allergic reactions, respiratory problems and other health issues. The most healthful living environment is mold-free. So What Does Mold Look Like? Black mold, one of the most common types of mold found growing in homes across America and a type of mold that causes some of the most severe health problems, is typically black in color, as its name suggests. Sometimes there is a whitish coloring around the edges of a patch of black mold, however. It often looks slimy. In some of our mold photos, like this one of black mold growing in a bathroom, you can see what a severe mold problem might look like. 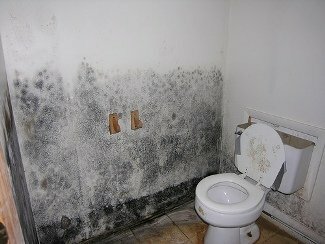 If you catch a mold problem early, though, you can prevent your bathroom from looking like this. Keep in mind that if you do have such a severe mold problem in your bathroom, mold may be growing inside the wall as well as on the wall. Mold may have also spread to your HVAC ducts. What Does Mold Look Like Growing in Other Places? While it’s common to find mold in bathrooms due to the warm, damp air and surfaces in there, mold can be found in many other places as well. Of course, mold growing in other places may look a bit different, even if it’s the same type of mold, Stachybotrys chartarum. The amount of mold growing in one place can have a big effect on its appearance, as well. We hope these mold photos will give you an idea of what to look for if you are checking your home for black mold. We recommend consulting with a mold remediation specialist if you need more information about what does mold look like or if you need help identifying the type of mold growing in your home. In this mold photo (above), you can see how black mold might look on a ceiling. Since the ceiling in this photo is painted white, the mold is easily visible. On a darker colored ceiling, mold may not be as apparent. 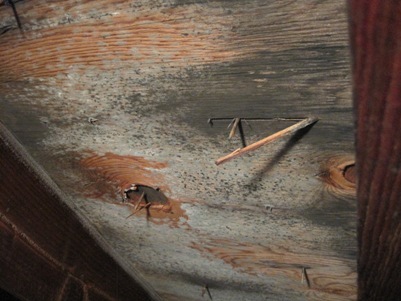 And in these mold photos (to the right and below), you can see how mold might look growing in an attic. People often think of mold as something found in basements, and in fact mold does often grow in basements, but it can easily grow in attics as well. All that is needed is a small leak in the roof to introduce enough moisture for mold to grow well. 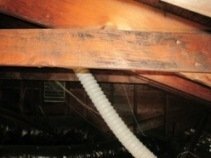 Since most people venture into their basements more often than their attics, a mold problem in the attic can go on for quite some time before homeowners even realize they have a problem. Of course, bathrooms, attics, basements and ceilings are not the only places mold might grow in a home. If you suspect a mold problem in your home, you’ll want to check everywhere for mold. Identify the type or types of mold growing in your home (people often have more than one kind of mold). Locate mold in hard-to-see places, including under carpeting, inside walls and inside heating and air conditioning ducts. 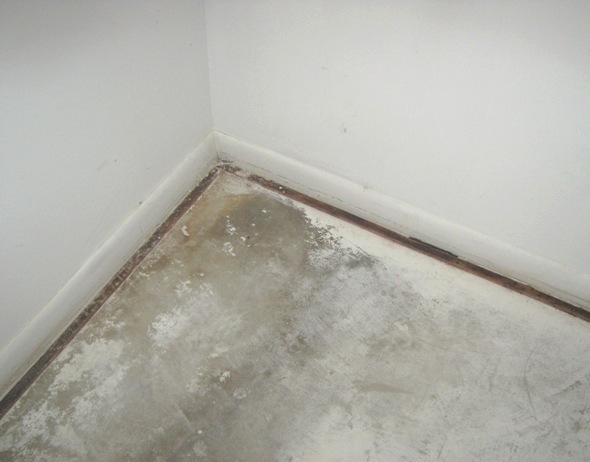 Advise you of the best way to remove different types of mold and the best way to remove mold in different locations. Remove all the mold in your home, if you don’t want to do the job yourself, or remove mold in difficult-to-reach areas if you want to do the easier parts yourself. Many mold remediation specialists will provide a free consultation, so even if you want to handle the cleanup yourself, we recommend taking advantage of the free information and advice. For a list of local mold remediation specialists offering free consultations, just follow this link.